Mapping is not just for cartographers. Many of the very best maps have been made by people that have little formal education in cartography or, even, many examples to their name. What they achieve is the ability to bring a fresh perspective to a specific theme and a perfect storm provides the conditions in which their map is produced. Of course, this is the exception rather than the rule and a cartographer will likely hit the mark more often than a non-cartographer. If we’re looking for design ideas and cues in mapping that helps us see the world in a different way then perhaps looking at purely artistic endeavor is one way we can imbue a more artistic temperament in our work. We explored one example in MapCarte 3 with ‘Map’ by Jasper Johns. 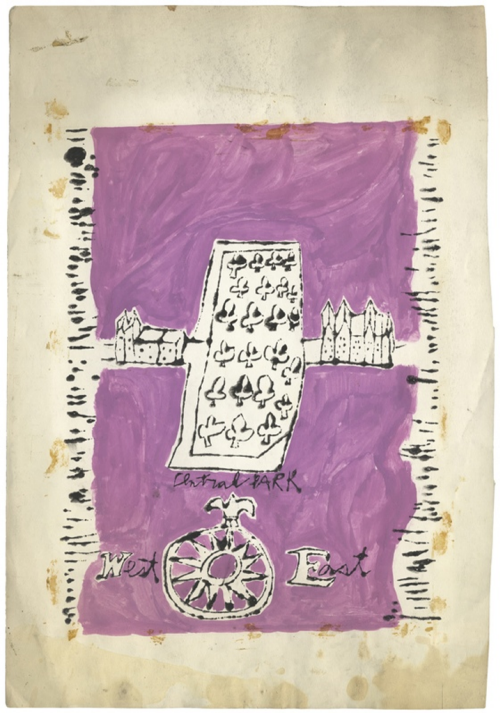 Here, we show perhaps pop art’s greatest exponent experimenting with the map. Andy Warhol, perhaps best known for his self portraits, bananas, Campbell’s soup cans and pictures of celebrities turned his attention to the map in these two works, both of Central Park, New York in 1949 and 1954. Like most art, it’s really up to the viewer to interpret them as he or she wishes. In many ways they are whimsical, almost incidental works that might have taken very little time to draw and paint. But their beauty lies in their simplicity. While slightly different in style and method, both maps contain simple shared characteristics. Both focus on Central Park. Both contain a clarification of east and west, one as labels across the map, one as a compass rose. Both contain simple representations of some streets; stylized buildings simply to represent existence rather than form; and the rivers are symbolized to border Manhattan island. They each contain the very basics of what a map is…scale, orientation, context, symbols and a focus. The more you study these examples the more you see…the lack of a line to represent the coast, the use of colour to demarcate land, the systematic tree symbols, the orientation of some of the buildings in aspect to align with the road, and the isometric buildings in the later example. 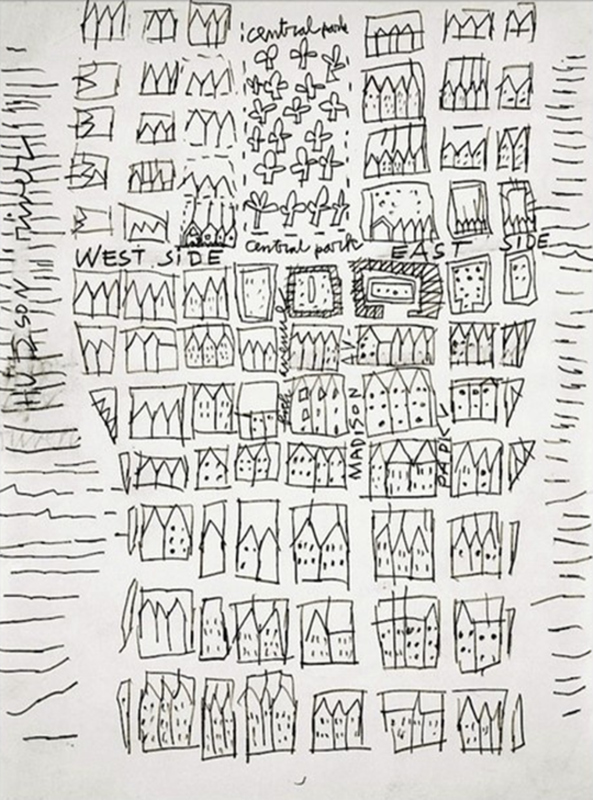 Despite the apparent simplicity of the work, there are many cues Warhol has taken from more traditional maps. He’s woven them into art that represents the map but which allows us to see how the map itself can be deconstructed.